If you like meatloaf sandwiches, you will love these flavorful meatloaf sliders. The mini meatloaves are baked either in burger form or in muffin cups and then they're served with slider buns and your favorite toppings. The ground beef mixture is mixed with a variety of simple seasonings you probably have in your pantry. Use your favorite barbecue sauce in the ground beef mixture or use ketchup or chili sauce. I used a food processor to make the bread crumbs and mince the onions and peppers. 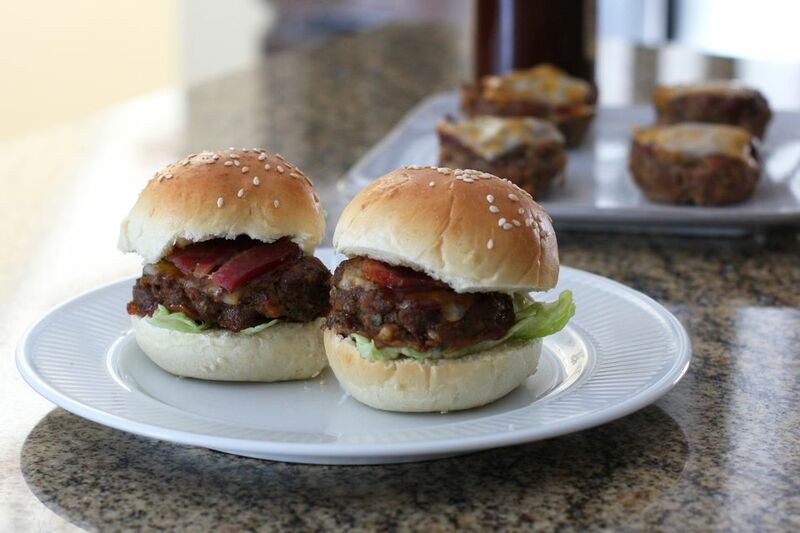 Serve the meatloaf sliders in purchased slider buns or make my homemade slider buns. Heat the oven to 350 F. Spray 18 muffin cups with nonstick cooking spray or line a large rimmed baking sheet with foil and spray with nonstick cooking spray. In a large bowl, combine the ground beef, bread crumbs, parsley, finely minced onion and bell pepper, thyme, black pepper, salt, egg, and 1/3 cup of barbecue sauce. Mix well until ingredients are thoroughly blended. Using a 1/4-cup measure, pack 1/4 cup of the meat mix in each muffin cup, or place on the foil lined baking sheet and flatten slightly to a burger shape. Bake for about 30 to 40 minutes, or until cooked through. The meatloaves should register at least 165 F on an instant-read thermometer inserted into the thickest part of a mini meatloaf. Brush each mini meatloaf with a little barbecue sauce. Cut the cheese slices into quarters, if using. Top the sliders with cheese and return to the oven; bake just until the cheese has melted, about 2 minutes longer. Remove from the oven and let stand for about 10 minutes. Split the slider buns and toast if desired. Assemble the sliders with a mini meatloaf and toppings of choice. Makes 18 mini meatloaves, about 2 ounces each. If you can't find slider buns, use pull-apart dinner rolls. King's Hawaiian Rolls are just the right size for sliders.Pull them apart and slice them horizontally.